On Saturday PAGE wrapped up our November and December tournament/campaign series at Redcap’s Corner with The Cataclysm on Caldor IV. The day consisted of two parts: Four rounds of Recon Squad followed by a Cataclysm game. Our Recon Squad format is a 200 pt Kill Team-style skirmish variant in which each model acts independently. Cataclysm is our framework for multiplayer, Apocalypse style games, in this case a mini-Apocalypse with 500 pt armies. Full details, including the mission pack, campaign mechanics, and other rules are up on the event webpage. Full results with breakdowns are in the final spreadsheet. More photos are up in the Flickr gallery. As developed in last month’s campaign, Caldor IV is a former Knight world ravaged by infighting and strife eons ago. Several decades ago the Mechanicum began resettling the planet as cover for an expedition searching for The Scythe of Unbound Light, a long lost relic weapon. All manner of xenos, heretics, and traitors eventually learned of the true motivation for this effort and recently descended on the planet. In the outcome of last month’s campaign, the Forces of Order located and evacuated Magos Ferdinand, head of the Mechanicum expedition. The Legions of Discord located The Scythe but did not manage to retrieve it. Still convinced The Scythe is a myth and unwilling to continue wasting resources defending the planet, Order has abandoned Caldor IV and declared it Exterminatus. With the relic actually located though, the uneasy Discord alliance has fractured in a bitter struggle to secure it before the end. Working quietly amidst the planet-wide conflict, one band of Chaos Daemons has pinpointed the remaining pieces of The Scythe on Apollon, the primary continent. Broken into several major pieces long ago, a shanty town has grown up around the mostly buried wreckage, no one aware of what lies just below. With the larger Discord alliance fallen apart, the Daemons have tricked and co-opted several groups of stragglers from the departing Imperial forces to help them strike for the ensorcelled relic and secure the components before it’s truly destroyed with the planet. However, several more factions new to the battle have also arrived in force to capitalize on the disarray and gorge on bloodshed while disrupting their hated foes’ efforts. Most menacingly, a large group of Tyranids and Orks working together, possibly awful mutant hybrid products of the Octarius War, have come to stop them. 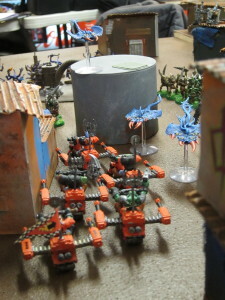 Orks ride into combat, going head-to-maw with the Daemons. Starting the day, each player chose a legacy for their Recon Squad from eight options: Bodyguards, Excavators, Headhunters, Killers, Penetrators, Scouts, Sentinels, and Warriors. 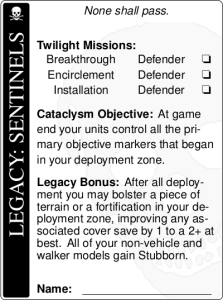 Legacies represent their squad’s path through the final fighting on Caldor IV, defined by three specific missions and roles they’re trying to fulfill from eight thematic scenarios in the Recon Squad rounds: Ambush, Assassination, Battlefield, Breakthrough, Encirclement, Excavation, Installation, and Skirmish. 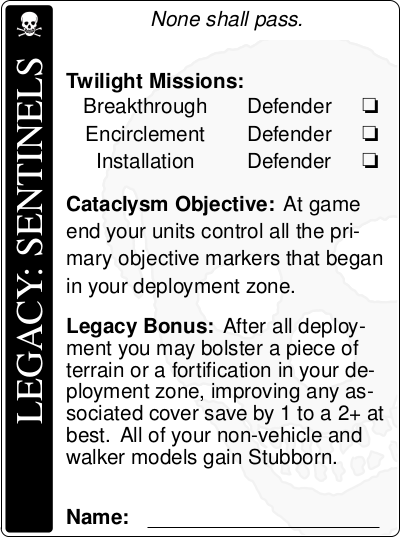 In the Cataclysm they then also received a personal objective based on their legacy. Achieving two of their three missions also granted a bonus in the Cataclysm. For example, the Sentinels were attempting to defend against a Breakthrough, survive an Encirclement, and protect an Installation. 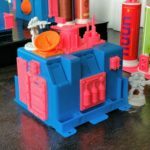 In the Cataclysm they were striving to have their units in place on each of their home objectives. 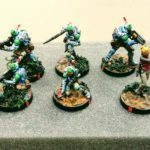 The bonus for achieving two of their missions was bolstering a piece of terrain or fortification, and their non-vehicles and walkers gaining Stubborn. In the Cataclysm, all the players came together for a joint mini-mega-battle. The battle was fought over six cumulatively scored objectives, two in each deployment zone and two more in no-man’s land. On top of this, each player was trying to achieve their legacy goal. With four players a side and 500 points each it wasn’t actually a particularly big game, but with everybody on one table it was suitably chaotic and bloody. Whole units were wiped out at a blow, armies lost ground as quickly as it had been claimed, and giant monsters did battle with brave warriors. All of this was contested among heavier terrain than usual. Recon Squad games were on 4×4 boards. Several were Infinity setups that the store uses regularly. 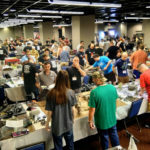 Others used a great deal of Warhammer Fantasy and 40k terrain. For the Cataclysm we simply took two of the similarly themed shanty town boards people had been fighting over all day and put them together for a heavily terrained 4×8 board. 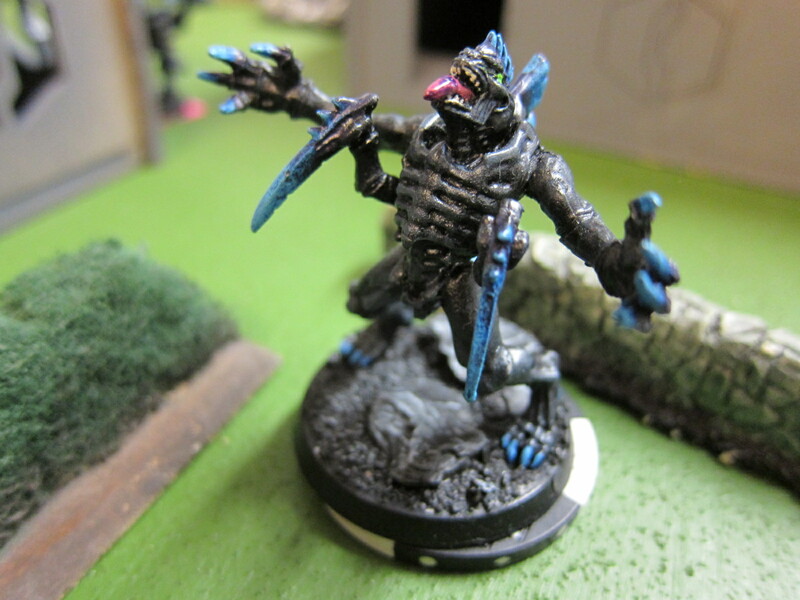 Kingbreakers fight Genestealers and Broodlords among the corridors and laboratories of a now-abandoned research facility. 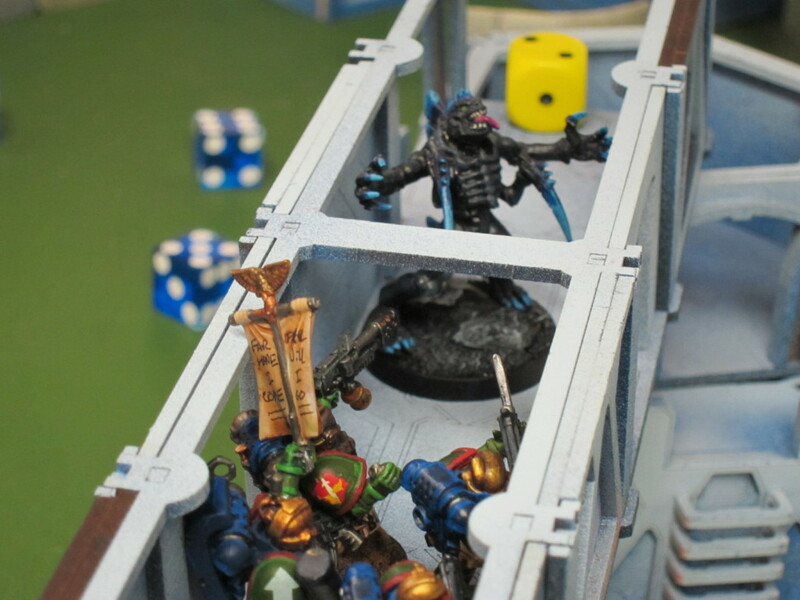 The Spoilers effectively disrupted Discord’s forces throughout the end of the battle, with their Recon Squads winning the first rounds 90 points to 71. 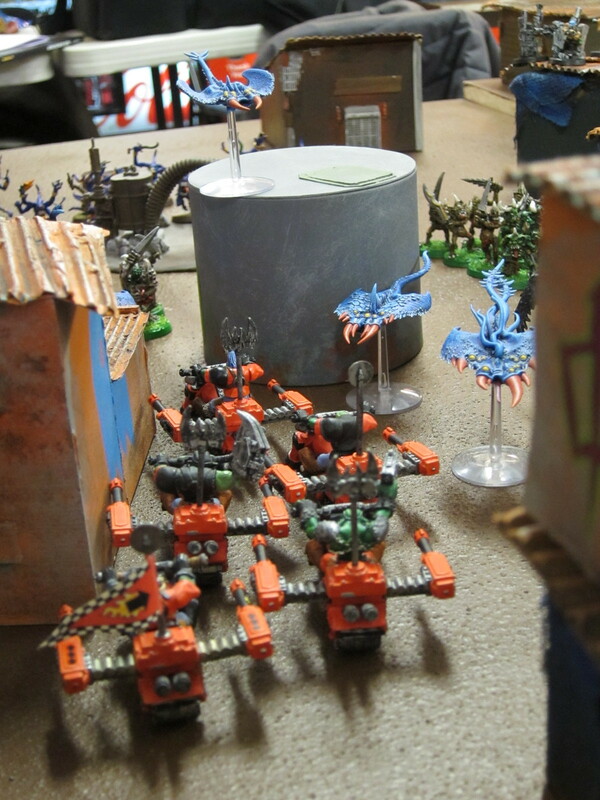 Discord however repelled the attack in the Cataclysm, holding the majority of the objectives for a 20 to 15 victory. With a slight lead remaining at the end of the day, the Spoilers thus achieved their goal of general slaughter and carnage to disrupt the other armies, while Discord managed to persevere through that affliction and ultimately retrieve The Scythe before the Imperium cracked the planet into pieces. Though tragically working for the dark side, a squad of the Sentinels of Terra lived up to their name, successfully defending an important communications facility, living through an encirclement, and successfully organizing the defenses around the Discord home objectives. 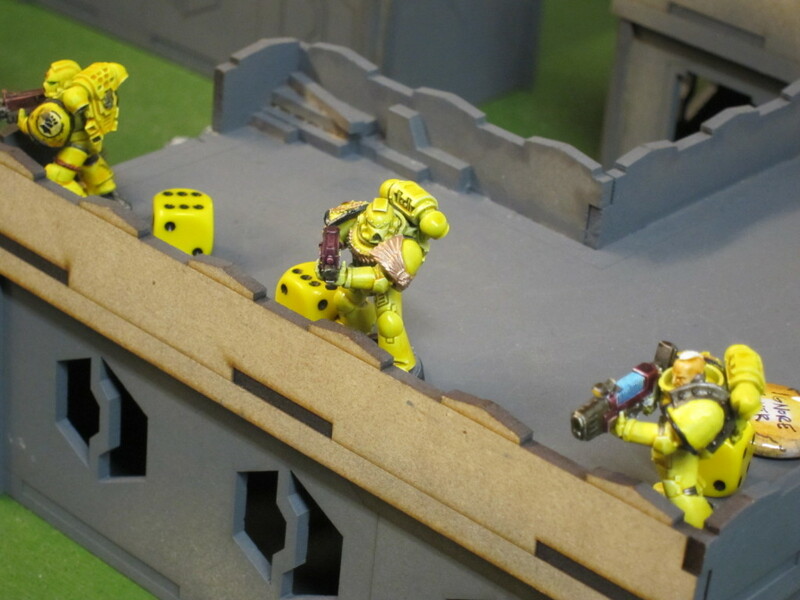 A small force of Imperial Guard fought desperate battles throughout the day against Tyranid monsters towering above them, but eventually had their due when they assassinated their foes’ Brood Lord warlord in the Cataclysm. Horribly lead astray in the fog of war and Chaos trickery, Kingbreakers and Raukaan wound up at each other’s throats, with heroic but misguided sergeants oathing crusades against their own battle brothers and plunging forward in their transports toward mutual annihilation in the closing moments. Despite the loss of their Brood Lord, the Tyranids managed to swarm the Imperial Fists leading the Discord defense and eat their Sergeant whole, consuming his biomass and assimilating his traits. Over the course of the whole Caldor IV campaign then, each faction (Order, Spoilers, Discord) won one of the three acts. Order secured the Magos Ferdinand in The Debacle, the Spoilers had their fill of hand-to-hand combat and biomass consumption in The Twilight, and Discord retrieved The Scythe of Unbound Light in The Cataclysm. With that the story of Caldor IV and the planet itself ends, but there’s little doubt these elements will appear again. Again, there are lots more photos are in the Flickr gallery! Our next Redcap’s event is set for January 24th. It will almost certainly be more conventional, 1500 or 1850 points with new missions but using the same basic mission format (primary/secondary/tertiary objectives, superheavy debuffs, etc.) we rolled out last month. In the Interim we’ll be tweaking the Caldor IV missions and campaign and then putting out a PDF for other groups to make use of. 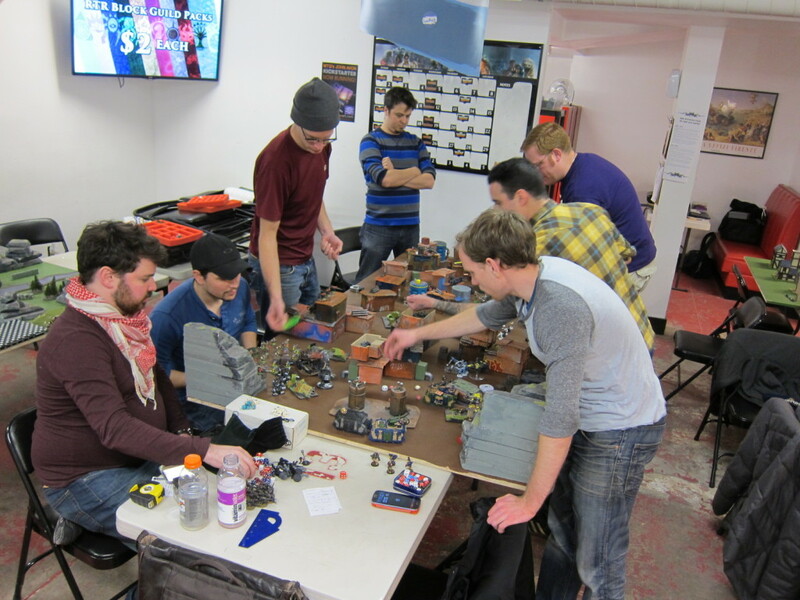 Come join us next time, it’s quite different from standard 40k and tournaments, and does a good job of combining tournament play with a narrative campaign! 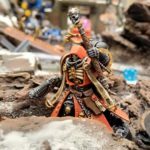 This entry was posted in miniatures and tagged 40k, battle report, caldor iv, design, featured caldor, featured campaign, miniatures, narrative, page, redcaps, rules, tournaments. Bookmark the permalink.